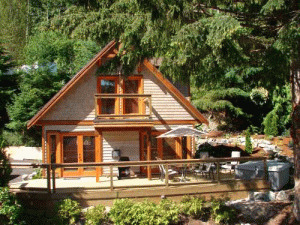 Sunshine Coast Resort & Marina offers a full spectrum of great ocean front accommodations from our brand new executive cottages with private hot tubs and in-room steam saunas to one and two bedroom suites and rooms. Each and every one of our room types feature large decks or patios with breathtaking views of the water and snow capped mountains. 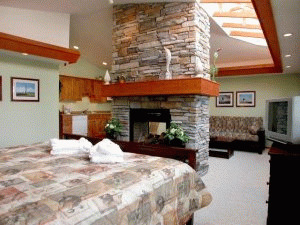 Most rooms offer full kitchens, fireplaces, jacuzzi soaker tubs and personal BBQ's. For the best accommodation experience on the Sunshine Coast there's only one choice...Sunshine Coast Resort & Marina. Let us introduce you to our newest addition! Our brand new Two bedroom / Two Bathroom Executive Cottages. A completely new standard in fully self contained luxury ocean front accommodation. 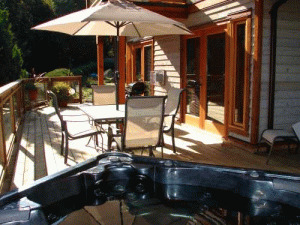 With private hot tub's and BBQ's, in-room steam saunas and whirlpools, gourmet kitchens with granite counter tops and stainless appliances, high end furnishings, fireplaces and LCD TV's in various locations throughout, each of these 1.200 sq.ft. masterpieces offers our guests the ultimate Sunshine Coast accommodation experience. So far everyone who experienced it wanted to move in permanently...! Our extremely popular one and two bedroom luxury ocean view suites are laid out for families who like upscale accommodation but don't need the space of a large cottage. With between 550 to 850 sq. ft. of living space our suites still offer plenty of space, a king size bed and a queen size futon bed, full kitchen, large luxury bathroom with jacuzzi soaker tub, stone fireplace, TV/DVD and large, furnished deck featuring a breathtaking view of Pender Harbour's waterways and snow capped mountains. Sunshine Coast Resort offers a selection of motorboats and kayaks ranging in length from 12 to 17 feet with engines ranging from 20 horsepower to 75 horsepower. You can choose from a variety of open aluminum boats or fiberglass runabout's. Guided fishing and sailing tours are offered right from our marina. Tours to Princess Louisa Inlet can be reserved through us as well. 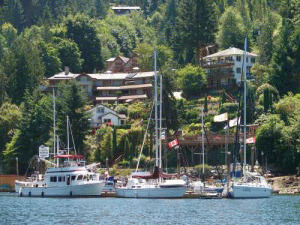 Please visit Sunshine Coast Resort & Marina Website. A guest likes the view, the area and the service.